The robotic company Festo has developed an Interior Flying Object. The object is a remotely controlled high tech toy and is the first indoor flying object with a peristaltischem drive which is able to maintain its position in the air by a central electric helium-filled Ballonett (video). The AirJelly steers through three-dimensional environments by shifting its weight. Its two servo motors are located at the “North pole” of the jellyfish and controlled proportionally. 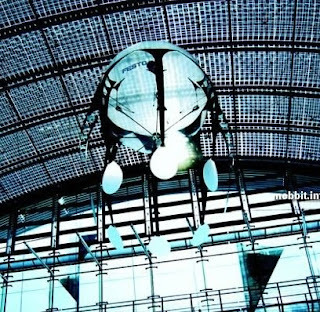 If the pendulum moves in one direction, the AirJelly’s centre of gravity shifts in this direction – the AirJelly is thus able to swim in any spatial direction. The propulsive force of the drive can be varied by moving the Fin Ray® tentacles more quickly or slowly. capable of dealing fatal blows Cassowaries are very unpredictable, aggressive creatures, especially if wounded or cornered. 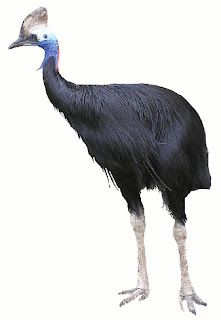 The Cassowary lives in the rain forests of the Northern Top of Australia and New Guinea and are very shy if undisturbed, but if you get to close and it thinks you’re a threat you could receive a bone-breaking kick or get sliced by its dagger-like sharp claws. Cassowaries are unique birds, (video) and have been in existence since the age of dinosaurs (prehistorically known as Emuwaires). They are extremely belligerent and protect their ground by nesting in flocks. They lash out with predatory instincts on their pray or enemies. They are very protective of their surroundings and keep they nest in thick vegetation. Cassowaries have a secret weapon up their sleeve, their legs are powerful and have sharp claws as long as 5 inches. They critically injure or kill their prey or enemy with a single kick. 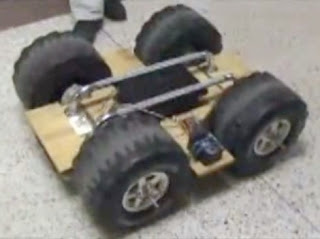 They hop into high gear with a top speed of 32mph even through impenetrable forests. They jump as high as 5 feet (1.5 meters) making them invincible to smaller animals. They are known to be exceptionally good swimmers. 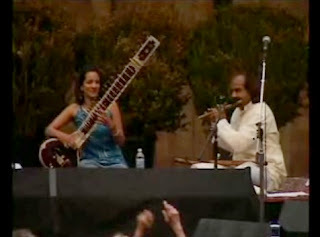 Anoushka Shankar is who you think she is: the twenty-six year old daughter of Ravi Shankar and half-sister to Norah Jones. Until now, art historians believed that oil painting started in Europe in the 15th century. But scientists recently found murals in a network of caves at Bamiyan, approx. 130 kilometers (80 miles) northwest of Kabul. The paintings, say scientists, were probably the work of artists who traveled along the Silk Road, the ancient trade route between China, across Central Asia's desert to the West. In 2001, two colossal 6th-century statues of Buddhas stood at the mouth of the caves (video). The Taliban, which then ruled Afghanistan, blew up the statues on the grounds that they were un-Islamic. The action drew international condemnation. 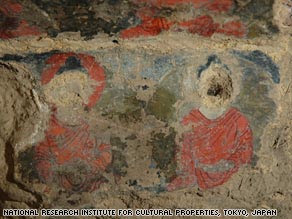 Inside the caves, scientists found murals that show images of Buddha in vermilion robes sitting cross-legged amid palm leaves and mythical creatures. To identify the organic components of the paint layers, researchers at the European Synchrotron Radiation Facility discovered that the murals were painted using drying oils, perhaps from walnuts and poppy seeds and were painted in the 7th century. 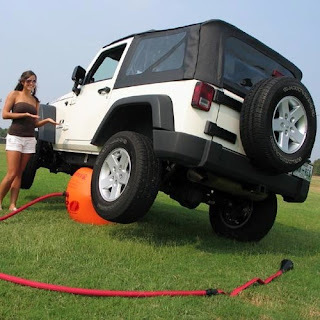 Exhaust Air Jack ? Gee how come no Genius has done this already ? When next you get a flat tyre, yank the air jack from your boot and root it under the door sill connect the hose to your exhaust pipe and walla and all In less than a minute ! (Google spelled backwards) is a mirror image of the Google search engine. This page and all the results are displayed in reverse. The site is called the "Google mirror" as a parody of the term mirror in computing, which usually refers to a copy or backup of another website. The site was created by a group called All Too Flat, who put up various comedy and satire pages on their website. To search on this search engine, a user must type in the keywords backwards for it to understand what is being searched for. 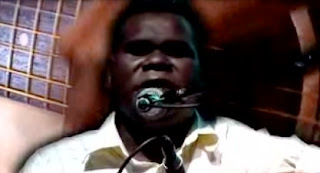 Blind from birth, Geoffrey Gurrumul Yunupingu is also called Gudjuk as he is , is from the Gumatj nation, his mother from the Galpu nation both First Nations peoples from North East Arnhemland. A former member of Yothu Yindi, now with Saltwater Band, Gurrumul's solo excursions highlight his beautiful voice which will never leave you as he sings the songs of his Gumatj country. Saltwater Band hail from Galiwin'ku on Elcho Island, North East Arnhemland, and are a much loved and popular Indigenous band, partly because of Gurrumul's influence and guidance. 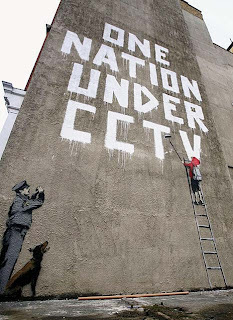 More Banksy on nevertheless here and here. Rocket Boom host Joanne Colon interviews Shaun Waterford who plans on breaking the world record for most days living underwater. Shaun Waterford designed his underwater habitat as a domed shaped capsule and it is made of concrete. It is also equalized at sea level and not an ambient habitat, so decompression is not an issue. The habitat will highlight ocean awareness and will be donated to an eco charity afterwards. More types and attempts of human underwater habitat deployment can be read here. Mechatronics is the combination of mechanical engineering, electronic engineering and software engineering. The purpose of this interdisciplinary engineering field is the study of automata from an engineering perspective and serves the purposes of controlling advanced hybrid systems. 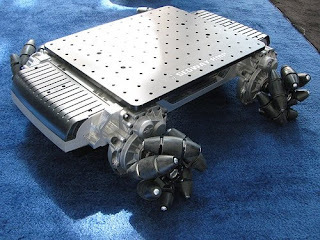 The hard disk drive (HDD) is an excellent example of the practical application of precision mechatronics. The video shows SC4 students demonstrating the mechatronic robot they built while in the SC4 Mechatronics program. For more information take a look at the mechatronics newsletter. 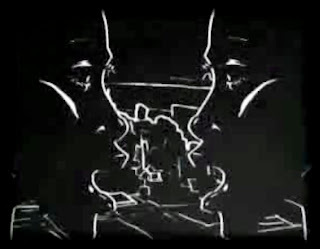 Ten years ago Jamirouqal stunned us with an illusion of a moving floor in this music video. German researchers have recently developed a real omni-directional treadmill which allows people to have the sensation of walking while staying in the same place. Watch the video of the real Cyberspace Interface in action. To make virtual walking a reality, the CyberWalk researchers had to address five key issues: providing a surface to walk on, controlling the surface in a way that minimised forces on the user, developing a non-intrusive tracking system, displaying a high-quality visualisation, and ensuring a natural human perception of the virtual environment. And while your wandering around on the treadmill your probably wearing one of these headsets. World's First Commercial Tidal Turbine @ Northern Ireland’s Strangford Lough. weighing 1000 tonnes, the turbine is rated at 1.2 megawatts, which is enough to power 1,000 homes and will generate energy sustainability with no noise and zero emissions, (video). It was built by Marine Current Turbines, and it will be the first commercial tidal turbine to produce energy, when it begins operation later this year. The turbine has two 16 meter-wide rotors and will be able to run for 18-20 hours a day. 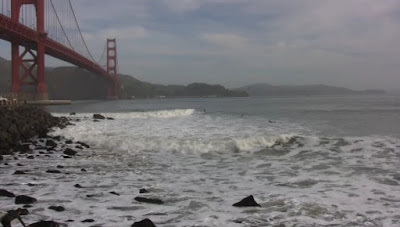 The turbine was installed off the coast in an area known for fast moving waters, and because the rotors will only spin 10-20 times in a minute, it is unlikely to disturb marine life. 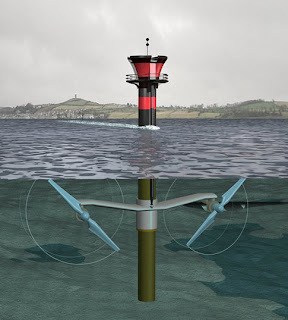 The £12,000,000 turbine will be fixed to the seabed in the mouth of the lough one of the fastest tidal flows on earth and will undergo a 12-week commissioning process where it’s operation and interaction with sea life will be monitored by teams of scientists. 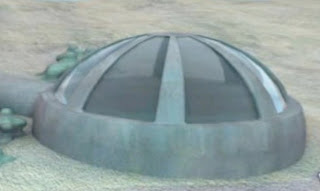 The turbine will be positioned 400 meters off of shoreline in Strangford Lough, which is know for its fast tidal current, and protection from severe weather. The rotors on the SeaGen turbine turn slowly: about 10 to 20 revolutions per minute. 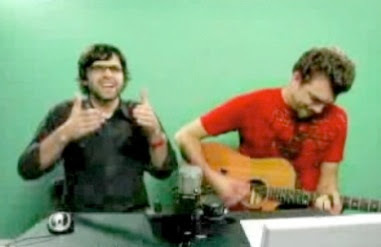 and more live casts of these guys plus heaps more of their other video material at The Rhettandlinkast live show which includes the opportunity of having live chats with them here. 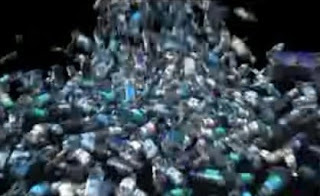 Here is a computer animation made to raise awareness about bottled water, and its surprisingly poor recycling rates. For example, it is estimated that in 2005 alone approximately 30 billion plastic water bottles were purchased in the US, with only about 12% recycled. For an in depth review on the differences between consuming bottled water or tap water watch this video, but perhaps one may wonder if bottled water worth it ? making plastic bottles requires almost the same energy input as making glass bottles, despite transport savings that stem from plastic’s light weight. The Sensisphere is a design concept prototype that may be less practical than MS Surface, but it's still cool. The Sensisphere is a unique display that users can use their hands to browse through and work with multimedia-based content over its generous hemispherical display. The interactive multi-touch Sensisphere lets you browse easily through multimedia content. Sensisphere is a concept prototype developed by Martin Spengler and Benjamin Mayer. Using mecanum wheels (which are really hypnotic to watch in action) and some of the innards from the infamous Segway personal transporter, the Segway RMP can move in any direction and can haul up to 400 lbs. Although details are sketchy about it at this time its anticipated to cost around 50k, nevertheless here are some more pics. RedZee may not load search results as quickly as Google, but it does let you preview a web site before you click through. When you search for something, you’ll see that a collection of Web page screenshots are available for you to scroll through to the left and to the right. And after you've clicked something a small page clip search box appears on top of the page you arrive at offering more possibilities. That comes in handy, because you can easily open multiple pages and flip back and forth between tabs, all within a single web browser tab. 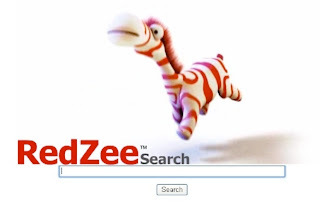 RedZee says; Conventional search engines use text as the main focus of their results, only bringing back 10 results per page. Almost 85% of searchers settle on what they find on that first page, often leaving them unsuccessful in finding what they truly were looking for. Although the desired results are more than likely buried deep, most people do not have the time or the patience to read through page after page of text based listings. They end up settling on the results that seem the closest and most convenient. With RedZee 2.0 you have a choice of up to 100 results which you can zip through lightning fast! The Web sites are the results instead of plain ordinary text, allowing you to sift through massive data quickly. Search 2.0 will take your search deeper where the best results are. No more settling! Our Earth is not at rest. The Earth moves around the Sun. The Sun orbits the center of the Milky Way Galaxy. The Milky Way Galaxy orbits in the Local Group of Galaxies. The Local Group falls toward the Virgo Cluster of Galaxies. But these speeds are less than the speed that all of these objects together move relative to the cosmic microwave background radiation (CMBR). The map indicates that the Local Group moves at about 600 kilometers per second relative to this primordial radiation. This high speed was initially unexpected and its magnitude is still unexplained. Why are we moving so fast? What is out there? Local Group is the group of galaxies that includes our galaxy, the Milky Way. The group comprises over 35 galaxies, with its gravitational center located somewhere between the Milky Way and the Andromeda Galaxy. The galaxies of the Local Group cover a 10 million light-year diameter. Whew thats some party. eh ? The Flag sequence towards the end of this video grabbed my attention by the sudden in your face color rolling kinesis which gave me an illusory sensation of transversal transcendence. This HD Video from Justin Feed helped me discover that the video is more poignant watching it full screen, so download it using your contextual menu in Safari, but strangely can't in Firfeox contextual menu ? This art installation,(video) in Terminal 3 of the Changi Airport in Singapore consists of an industrial robotic arm with cameras in the base, allowing it to face and track people in a friendly manner. bring a smile to your face and a moment of comic relief to your trip. Daisy is a robotic arm several times taller than a human, and it's got a massive fiberglass cargo ship propeller attached to it, which it'll randomly wave about in the air (slowly, luckily). It also has cameras fixed to its stand so that it can detect the presence of onlookers, and track them withits giant flower-like face. 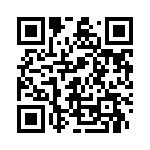 Here is an audio only site documenting a chat about the issues surrounding robot design. 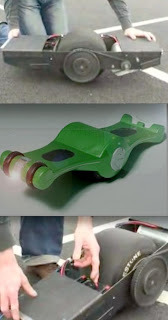 [iSlide] utilizes a hydrogen fuel cell and onboard gyroscope to attain speeds of around 15 kph. Described as a mix of snowboarding and skateboarding, the iSlide’s motion is controlled by leaning forwards (to accelerate) and backwards (to slow down). The video is rather long and the riders don't appear to be very active in their riding ! Nevertheless towards the end of the video clip we get close ups and explanations of the components and assembly, except to say that there doesn't appear to be any info as to how long the power in the hydrogen fuel cell lasts ? It appears as if the inventors or creators may perhaps begin manufacturing the platform if they get enough approval votes on their website. To document MoMA's Design and the Elastic Mind exhibition spanning design, science and technology, Cool Hunting enlisted the exhibitions's esteemed curator, Paola Antonelli. 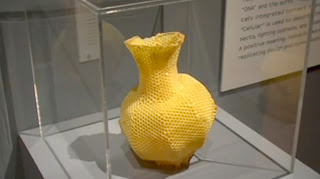 Paola speaks in detail about several of the exhibits, including "The Afterlife," a system for turning corpses into batteries, robots that act as personal climatizers and DNA origami. She also weighs in on her curatorial approach, addressing the role of the designer, her mission to shift public perception of design and how design revolutionizes our lives. This video focuses in some detail on a work that attempted to design a way of folding a piece of paper via Origam in order to create a model of the Fresnel Lens for the eyeglass telescope that could be automatically unfolded in outer space for the Space Program. The song is from Gong Gong's , reecently released album Mary's Springs. 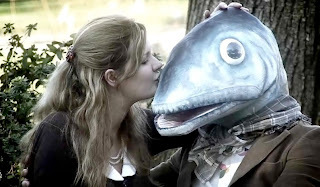 The fish head man reminds me of a satirical band in the early 1970's called the Residents that were successful in hiding their faces (read identities) for 10 years or more, by wearing fish head or other types of masks on stage. The piece of music Beatle Fish even vaguely sounds like many songs from the residents. 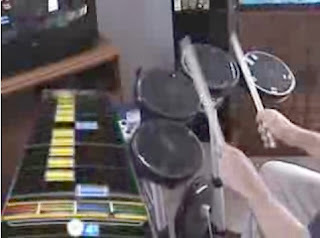 Seems like a great way to learn how to play the drums ! 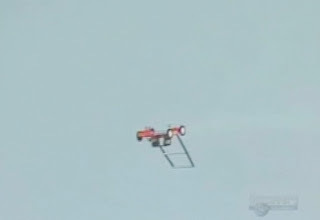 A Flying Lawn Mower ? The flying lawn mower brought to us by an air show entertainment company called Flying Thingz also shows the flying tank and a flying witch.